DVD $30.00 or download for $30.00 In stock. Order in the next 11 hours, 5 minutes and it will go out today! In stock. Order in the next 11 hours, 5 minutes and it will go out today! This DVD are unlike any other we have released before. This is your opportunity to spend three hours in the company of Roberto Giobbi and learn some of the finest card magic conceivable. You will learn great and powerful magic! It would be awesome if Roberto continues with this kind of downloads, I would love to see Giobbi on Dingle, on Ascanio and on Marlo. Thank you Vanishing Inc for producing such great downloads! Roberto Giobbi is a well known name in the world of card magic, especially because of his much respected Card College series of books. Most experts will agree that these influential volumes are among the best tools available to develop sound technique and to master the essentials of card magic. Besides being appreciated for his written work, Mr Giobbi is also well regarded for his ability in teaching magic, and has appeared in several videos made for this purpose. He's a true scholar, with an academic background that includes skills in mathematics, science, literature, and linguistics; he's also fluent in several different languages. With these remarkable credentials, it is no surprise that Roberto Giobbi's teaching materials are a real draw-card for magicians, and so Vanishing Inc Magic has done well to make a new video series featuring Giobbi that is entitled "Favorites". Vanishing Inc Magic is the publishing house, retail outlet, and brand of professional magicians Joshua Jay and Andi Gladwin, and from time to time they produce videos that are available from them as digital downloads. 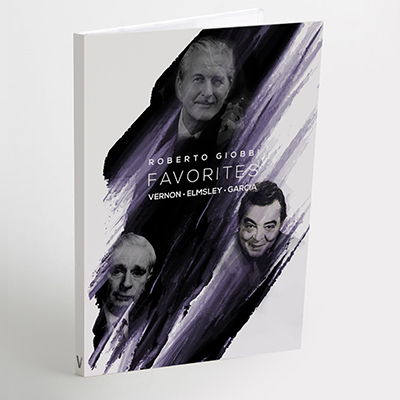 As part of their growing set of original material, they have teamed up with Roberto Giobbi in the production of three videos, each of which is entitled "Favorites" and features Giobbi performing and teaching a series of effects from a highly respected creator of card magic of the past; the well-known names being Dai Vernon, Alex Elmsley, and Frank Garcia. The three components of this series are available as separate digital downloads from the publisher, or as a combined set on DVD. What you get with this DVD are effectively three videos (Giobbi on Vernon, Elmsley, and Garcia), each of which is around 65-70 minutes in length. The production quality of the videos is excellent, with high resolution camera work, good visuals, and clear sound. Where necessary there are camera close-ups, and even an over-the-shoulder view so that more difficult sleights can be easily followed. In each case, the first 10-15 minutes features Giobbi performing a routine of three effects that he's chosen from the master magician of the past, and which he has carefully connected and constructed into a mini-routine. The performance part of the video features a number of spectators, while the explanation part of the video just features Giobbi talking to the camera. Before going on to teach the actual tricks that are part of each routine, Mr. Giobbi takes the time to share some background about the card magic "greats" that he is featuring, and he briefly explains something of their influence and impact on card magic. The remaining part of the video is an explanation of how to perform the effects, which Giobbi uses as an opportunity to teach valuable lessons that go beyond the tricks themselves. Dai Vernon is considered one of the fathers of modern card magic, and an all time great. Of the Vernon tricks taught by Giobbi, the opener "Emotional Reaction" is a fairly straight forward trick that is basically self-working, but has a lovely presentation. I especially loved the Gary Kurtz idea of referring to the cards as persons, and asking the spectator what name they'd give their selection. But as Giobbi points out, while it's a good trick in itself, it has principles usable for other situations. I particularly appreciated his idea of using Emotional Reaction if a card control in another trick goes wrong, and you need way to have spectator find the selection for you; or using it in a challenge situation where a spectator merely thinks of a card and wants you to find it. Like the first trick, "Four of a Kind" is a very smooth routine that is a masterpiece of elegant construction and effect, although some simple set-up is required. Giobbi offers a wonderful and easy way to do this, despite the fact that this immediately follows a trick that uses a shuffled deck. His very neat solution to this problem can be used for many other tricks, especially when constructed together as part of a mini-routine like this. The final trick, "Slow Motion Aces", is a mind-blowing Ace routine that is easily the highlight of the entire gig. It takes up a full half hour of explanation on the video, and requires real skill to perform, but is truly one of the great effects of card magic. Alex Elmsley is a highly respected amateur who came up with some truly original and brilliant ideas, some of which improved existing effects, others which were novelties from the ground up. Giobbi considers him one of the most important and influential card magicians of the twentieth century. "All Backs" is a nice piece in which the entire deck is made to appear as if it consists entirely of double backers. It's a nice idea, but technically very demanding, and takes up a good half hour of explanation time. I especially loved the second trick, "Double Swap", which is very clever, and has the novel idea of using two Aces like chop sticks to handle a selection. This generated looks of obvious amazement from the spectators in the performance video. The "1002nd Aces" trick offers a lovely handling of a four Ace routine, and one of its strengths is that the spectator has a genuine choice in which pile the four Aces end up travelling to. Frank Garcia left behind two more significant works - Super Subtle Card Miracles (1972) and Million Dollar Card Magic (1973). But as Mr Giobbi points out, in doing so he was often standing on the shoulders of the giants who preceded him, heavily borrowing from their work, and without always providing the kind of carefully documented attribution that we expect from creators of magic today. The Frank Garcia tricks Giobbi selected are not as strong as the ones chosen from Vernon and Elmsley, although in the right context they certainly will leave spectators gobsmacked. The first of these, "A Lady Up My Sleeve", takes its cue from the well-known expression "I have an Ace up My Sleeve", and is presented as an exercise of the Aces magically and impossibly appearing wherever the magician states they will - naturally this includes the magician's sleeve. "Ace Faroleros" sees the four Aces being produced in different ways, with a final twist occurring when they turn to Queens. The final trick of this trilogy is "A Surprise Package", which is a remarkable effect involving a sandwiched signed card that impossibly travels from between one set of queens to another. Giobbi notes that he's personally not that fond of sandwich effects, but this is his own favourite in the genre, and he's seen it generate many strong reactions in performing it many times. This was my first ever experience with Roberto Giobbi on video, although I'm familiar with his written work, and initially I found myself a little under-whelmed with his patter and presentation. Perhaps part of this can be attributed to having too high expectations, given his respected credentials. And to be fair, Giobbi isn't performing in his native language. He's more than competent with English mind you, and is probably more articulate in English than most of us! So this never becomes a barrier for the listener, although undoubtedly he would be even more at home in his native tongue. But given that this was billed as "Favorites", I was expecting the tricks themselves to be a collection of super strong magic, while in reality not everything was the kind of material that I'd consider mind-blowing - although they were certainly all very solid, and the effects included are high class. But now comes a disclaimer - because you must bear in mind that the above paragraph merely reflects my initial impression, and my somewhat luke-warm assessment soon changed after watching the explanations! One of Giobbi's real strength is his outstanding ability as a teacher and a scholar. Not only are his explanations are clear, but more importantly he is a real "thinker". He himself states at the outset that the selection of his material has been deliberately geared towards creating a discussion about important aspects of card magic. So it's essential that these videos not be judged by the performances alone - although these are by no means weak or flawed. However the real value of these videos lies not merely in the tricks themselves, but especially in Giobbi's insightful explanations and perspectives. These have a value far greater than the actual routines he teaches, since in many respects the individual tricks are largely a means to a greater end. Several times Giobbi says he is "suggesting" a particular way of doing something "for the sake of discussion"; he also mentions that there are many interesting lessons to be learned from exploring the material he deals with, and he makes good his promise to walk us through these lessons. And that's exactly what I loved about watching this video. Giobbi is incredibly articulate, has deep respect for his sources, and has a real gift for analyzing and explaining the small nuances that are essential for the construction of strong magic. In light of the above, it will come as no surprise that I would give Roberto Giobbi's teaching in these videos the highest praise. He's extremely articulate and remarkably insightful. He comes across as a real scholar and a true gentleman, with the utmost respect for those who have gone before him, as well as for his listeners. Perhaps most importantly, it's very obvious that he is a clever and deep thinker that gives careful thought to every aspect of his magic. And that's the kind of approach to magic that we must all aspire to have if we want to perform strong magic. We must go beyond parroting a routine we see performed on an instructional video, and must learn to understand the foundational principles that make magic work. And to learn those kinds of lessons, we can't do much better than selecting a teacher like Roberto Giobbi, joining him as he discusses routines from masters of card magic. Occasionally Giobbi adds his own ideas for elements of the trick, but what he's especially interested in is having us understand the construction of the magic being performed, and seeing how to solve apparent problems that present themselves in order to create an impenetrable illusion. A teaching approach like this encourages both creativity and personalization, and doesn't just help us learn magic, but understand what makes it work. That's just a small sampling of the gold nuggets that lie within - there's much more! Lessons like these shamed me for my initial reaction, and now I began realize and appreciate how carefully constructed Giobbi's routines were, both technically and presentationally, in view of all the subtleties he has built in! There is some relatively easy material here, such as Dai Vernon's "Emotional Reaction", which practically falls into the self-working category. But there are also routines here that require advanced card-work, especially some of the Ace routines. They are absolutely lovely to watch, and Giobbi's own sleights and technical ability are flawless. He makes them look easy, and even the handling in the explanations is never awkward or clumsy. But some of the sleight of hand required is quite challenging, and will even stretch the intermediate magician. Vernon's "Four of a Kind", for example, requires proficiency in palming and a half pass, so this is not material for beginners, although intermediate magicians will appreciate that Giobbi does explain and teach all the sleights he uses. Some of the other tricks require real skill to perform, and will not quickly be mastered. But it needs to be remembered that the aim of these videos is much more than just learning the tricks. You might find yourself loving the material itself, of course, and perhaps you will even add one or two of these tricks to your own repertoire, or even adopt an entire seamless routine of three tricks for yourself. There are some fantastic tricks included here, to be sure. But even if you never go on to learn or perform any of them, this video's worth lies in the many insights that Mr Giobbi shares, which have application to card magic far beyond the tricks he teaches - as good as they are in themselves. Having watched a lot of instructional magic videos over the years, my experience with Roberto Giobbi's style has made many others pale in comparison. It's obvious in every way that we are learning from a passionate professional, a man devoted to the art of magic, and a true expert who has real insights to share and learn from. Even relatively beginners can learn a great deal from the way he approaches magic, and can benefit from the many insights he shares along the way. I give this video series my highest recommendation. If I had to choose only one of the three as a digital download, I would opt for "Favorites - Giobbi on Vernon", simply because it has arguably the strongest material. But all three videos are outstanding, especially because of the insights that Giobbi shares in the course of his explanations, and I wouldn't hesitate in recommending the entire package as a DVD.